His popular novels include “Amrita“, “Venu Vatsala“, “Purvarang“, “Laagni Samjyaa Vinaa Chuuta Padvanu” and others. While his most-known novel “Amrita” (1965) explores the concept of existentialism, other works like “Rudramahalaya” (1978) and “Somtirth” (1996) are historical fiction. He is a recipient of Sahitya Akademi Award for his novel, “Trilogy Uparvaas” in 1977. 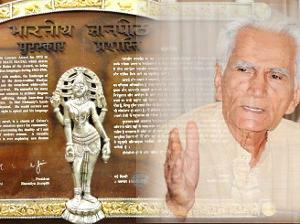 Jnanpith Award is one of the two most prestegious literary honours of India (other is Sahitya Akademi Award).